Plans for a new mixed use development in Birmingham city centre have passed their first hurdle. The development – named Exchange Square – will be built on land currently used as a car park where the old Masshouse Circus once stood. Birmingham City Council has granted outline planning consent to Manchester-based Nikal Group to build the second phase of its scheme, which could include 60,000 square metres of commercial space across two buildings, retail and a 200-bed room hotel and apartments, all set around a new public square. The prime location at the junction of The Priory Queensway and Moor Street Queensway, has not been built on since the Masshouse Circus roundabout was demolished in 2002. Planning permission was granted for the site in 2008, but the development hit the buffers in the recession and Nikal submitted a revised planning application featuring several amendments. The new public square has been relocated from the centre to the edge of the site, with one side open to Priory Queensway. The office buildings have been reconfigured to offer larger floorplates over fewer floors. James Payne, development director at Nikal, said: “We are naturally delighted with the decision by Birmingham City Council to grant outline planning consent for this scheme. “Exchange Square represents one of only a few deliverable solutions to the perceived upcoming shortage of Grade A space in Birmingham over the next two years. With a cleared site and infrastructure in place, we could achieve completion of any of the planned buildings within just 18 months. “While the quantum of space itself has remained unchanged, we have worked closely with Glenn Howells Architects to ensure that the layout of the site conformed both practically and aesthetically to the design that we had in mind for the space. 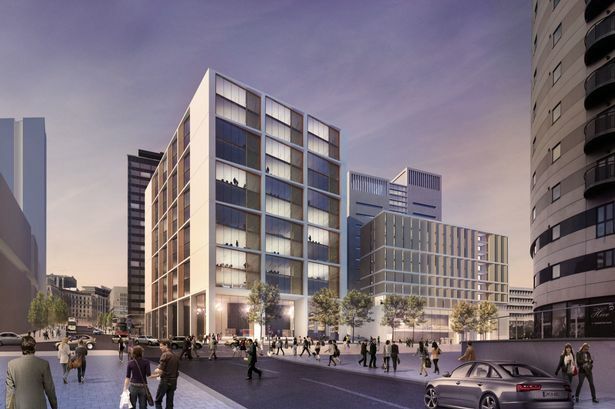 Nikal said the mixed use site, which falls under the City Centre Enterprise Zone, will provide a natural extension to Birmingham’s existing core and connect the centre to the regenerated Eastside and proposed HS2 station. Exchange Square is designed to be delivered in phases, with the public square and any of the site’s three planned buildings able to be brought forward, depending on market demand. Power to the site will be provided via the existing combined heat and power generator at Aston University, which already provides heating and hot water to Nikal’s residential development at Masshouse. Joint agents for Exchange Square are Jones Lang LaSalle and GBR Phoenix Beard. Savills acted on behalf of Nikal during the planning stage. Sir Albert Bore, leader of Birmingham City Council, said: “I have been a longstanding advocate of the redevelopment of Eastside, which I have always felt was a sadly overlooked and neglected part of the city.